← Eat, Fast and Live Longer. A 5-2 Fast Diet Recipe Idea Under 100 Calories. Mini Berry And Yoghurt Smoothie Bowls. There’s a certain curiosity associated with baking with herbs. For me it started with a visit to Lavandula in Victoria’s beautiful Hepburn Spa region and Stephanie Alexander’s lavender scones. Before too much longer I was inspired to add a little finely minced fresh lemon thyme and a tablespoon of gin to one of my family’s favourites; a cream cheese pound cake. The result was divine. A revelation. The sharp tang of citrus rounded out by subtle herbal undertones. A marriage made in heaven. These holidays, with a full house of willing taste testers, I’ve been at it again. Experimenting in the kitchen. Our rosemary bush and lone lemon tree are thriving; two of the few non ornamental plants in our garden I somehow haven’t managed to kill off. Rosemary and lemon. A classic flavour combination used in Italian cooking all the time. Granted usually in a triumvirate with garlic as a wonderful flavour base for all manner of savoury dishes. Here they’re combined with polenta and pine nuts, sans garlic, to produce a gorgeously crisp on the outside but soft on the inside Italian style cookie. Deliciously sophisticated and decidedly moreish, they’re a little taste of Italy, receiving a resounding thumbs up. PREHEAT oven to 170C. Line 3 baking trays with baking paper. PLACE sugar, lemon zest and rosemary in the bowl of a food processor and pulse to combine. TRANSFER the sugar mixture to a large mixing bowl and beat with softened butter until pale and fluffy. ADD eggs one at a time beating well after each addition. Scrape down the sides of the bowl with a silicon spatula. SIFT together flour, polenta meal, baking powder and salt. Fold through the biscuit batter with the coarsely ground pine nuts. FORM level tablespoons (or heaped teaspoons) of the mixture into balls. SPACE well apart on baking trays and flatten very slightly. Garnish with rosemary, pine nuts and a sprinkling of caster sugar. BAKE for 15 minutes at middle to top oven rack positions until golden on the edges and bottom. ALLOW to cool a little on oven trays before transferring to wire racks to cool completely. Store in an airtight container. This entry was posted in Baked, What I Love to Cook and tagged Afternoon Tea, Autumn, Baking, Biscuits, Cookies, Italian, Lemon, Pinenuts, Polenta, Rosemary. Bookmark the permalink. 7 Responses to A Little Taste Of Italy. 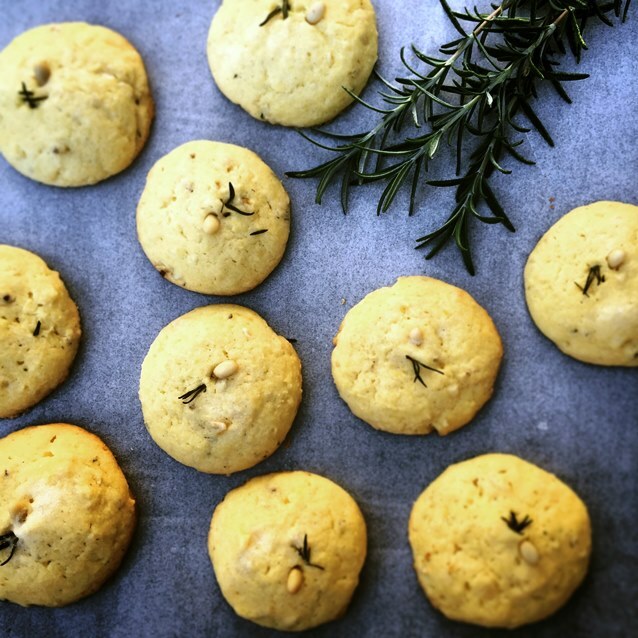 Lemon Polenta Cookies With Rosemary and Pine Nuts. They are! A little unusual but I’ll definitely be making them again. I love baking with herbs. It really adds such a nice subtle flavor to sweets. Your polenta cookies look wonderful. Thanks Seana. There’s only a little rosemary in these cookies but it certainly allows the lemon to shine. It’s an interesting question Laura. I think you’d need some sweetness to counteract the bitterness of the rosemary and lemon zest. I have a friend who swears by xylitol as a substitute and swaps it in a 1:1 ratio for for sugar. you could also substitute a mild honey – perhaps 3/4 cup. Just add to the butter and whip until very light and fluffy. Have never used agave syrup so can’t really comment on that – but it might be worth a try. I’d love to know how they turn out with a sugar substitute if you give it a try.